BETHLEHEM (Ma’an) — Israeli forces opened fire and injured dozens of Palestinians across the West Bank on Friday, as hundreds marched in a number of cities and villages in protest against the Israeli occupation and recent Israeli violence in occupied East Jerusalem. Israeli soldiers opened fire on rallies in Nabi Saleh, central Hebron, at Qalandia checkpoint and in al-Bireh near Ramallah, in Kafr Qaddum, al-Masara, Jalazun refugee camp, Aida refugee camp, and in other villages across the West Bank, injuring dozens. Two Israeli soldiers were also reported injured in clashes that erupted following the protests. The protests came after a night of violence in Jerusalem, where two different hate attacks were reported against Palestinians on the basis of their ethnicity, in addition to two other such incidents inside Israel. On Friday afternoon, meanwhile, a Palestinian woman was run over by a Jewish settler near Shufat in East Jerusalem, and later in the evening a brawl erupted as a group of Jewish settlers passed through the Palestinian neighborhood of al-Tur, resulting in the stabbing and light injuring of two Jews. The violence follows escalating tensions in the holy city, where the long-term dispossession and discrimination by Israeli authorities who have occupied the city since 1967 has combined in recent months with a series of heavy-handed security operations and right-wing politicians’ religious provocations to form a combustible mix. Nightly protests in Jerusalem by Palestinians have been met by heavy police force, while a series of attacks with cars or by stabbing undertaken by individual Palestinians against random Israelis has been countered by right-wing Jewish mob violence across the city. Despite this, protesters across the West Bank held more than a dozen marches condemning the violence of Israeli authorities and calling for end to the occupation. Hundreds of Palestinians marched in a Day of Rage in solidarity with the Al-Aqsa Mosque and the people of Jerusalem in Hebron, where assailants attacked an Israeli military post with a Molotov cocktail earlier in the day. Two Palestinians were injured with rubber-coated steel bullets in clashes with soldiers that followed the protest. An Israeli military spokeswoman told Ma’an at least 350 Palestinians marched in the rally. Two Palestinians were injured by live bullets during clashes with Israeli forces on Friday in the village of Nabi Saleh, meanwhile, where soldiers cracked down on a weekly rally. Nariman al-Tamimi and Basil al-Rimawi were injured after Israeli forces fired live and rubber-coated bullets, tear gas canisters, and stun grenades at protesters marching against settlement activity in the village. They were both taken to a hospital for treatment, and al-Tamimi underwent an operation as a result of the attack. Earlier in the day, Israeli soldiers fired tear gas and live fire at demonstrators near Qalandia checkpoint, hitting a Palestinian youth in the foot. An Israeli army spokeswoman said at least 80 Palestinians hurled rocks and Molotov cocktails at Israeli forces, lightly injuring one soldier. 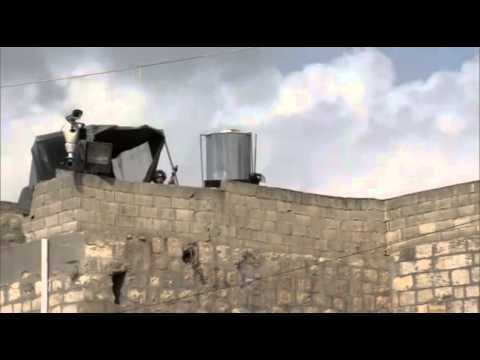 In Bethlehem, youths clashed with soldiers near Aida refugee camp. Three Palestinians were injured during clashes in Kafr Qaddum in the Qalqiliya governorate and Israeli forces sprayed Skunk water at demonstrators. Israeli forces dispersed a weekly march in al-Masara village near Bethlehem and assaulted protesters as they attempted to reach confiscated village land.